Ethnic food is all the rage at the moment. We’ve already discussed internationally flavored breakfasts and Southwestern cuisine, so now it’s time to put the focus on Greek cuisine. 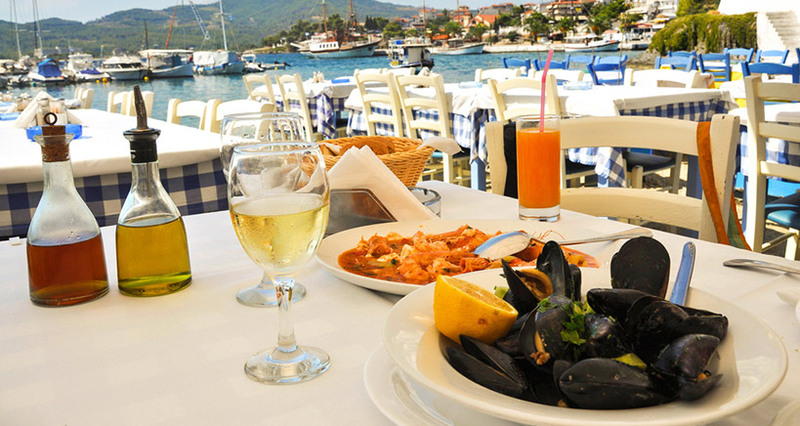 With its heart-friendly ingredients and unique dishes, along with amazing taste and fabulous flavors, Greek cuisine has been enticing foreigners and natives alike for many years. Here, you will find all you need to know about the history of Greek cuisine, as well as the spices and elements that will make it a hit at your next catered event. Greece, located in the southeast of Europe, has a rich history and culture that permeates throughout the country. Though Greek cuisine has evolved significantly over the course of Greece’s history, many traditional dishes are still popular today. Typical Greek cuisine is derived from a general Mediterranean palette and consists of what is known as the “Mediterranean Triad”: grains/wheat, olives/ olive oil, and grapes/wine. The olives and olive oil in particular; and fruits, vegetables, honey, and fish in general, are the pillars of Greek cuisine, and these foods combined, have made Greece to be known as the birthplace of one of the healthiest diets in the world. In the times of ancient Greece, the Greeks typically dined on three meals a day: breakfast, followed by a mid-day meal, and then an evening meal. Breakfast consisted of a few light dishes, such as bread dipped in wine, with an assortment of olives or figs to accompany it. The mid-day meal was also light, focusing on small, enticing cooked dishes, such as a vegetable stews, along with cheese, bread, and salad, which made the evening meal the most important meal of the day. Dinner consisted of dishes that included a variety of ingredients, such as beans, lentils, wheat and fish, as well as an assortment of meats, and salads. Not much has changed in the Greek diet over the course of their culinary history, though there is one big difference. In ancient times, utensils were rarely used, and the most common dishes were eaten with one’s fingers. While a few dishes are still eaten in this manner, most lovers of Greek cuisine use a knife and a fork. As for the similarities between then and now, they are too numerous to count. Much like Greece itself, the intricacies of Greek cuisine have endured over time: olive oil is still included in almost every dish, wine is always offered, and families and friends are still important ingredients in any meal-based gathering. In addition to olive oil, Greek cuisine tends to use a wide variety of exotic and different spices to accentuate the dishes. Most of the spices are available anywhere in the world and they include mint, basil, cumin, cinnamon, coriander, oregano, and saffron. Coriander, also known as cilantro, is used in a variety of dishes that range from marinades for lamb and beef, to hummus and baked dishes. Oregano, one of the most popular spices, is also paired with marinades, and is used in salads, as well. Greek cuisine also makes use of za’atar (pronounced zah-tar), an aromatic spice blend that combines toasted sesame seeds, dried thyme, dried marjoram, and sumac. This intoxicating blend incorporates a variety of herby flavors in a pungent, olive green combination that is as delicious as it is multi-purpose. There are literally hundreds of amazing Greek dishes to choose from, though some particularly popular dishes stand above the rest. 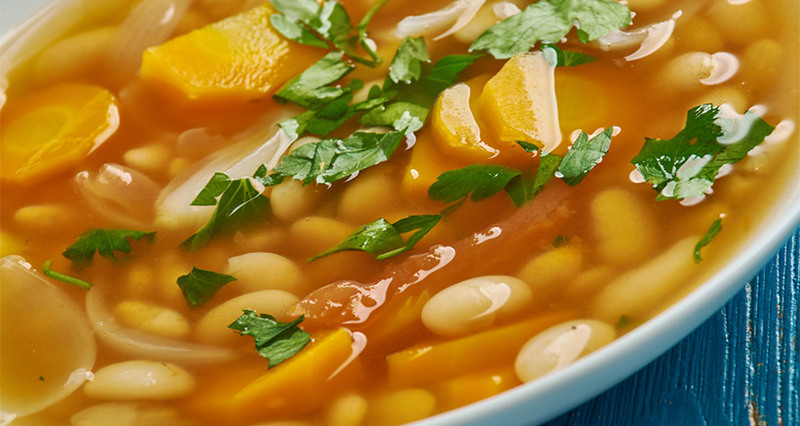 Start your Greek-themed meal with Fassolatha, a satisfying and robust white bean soup that uses many traditional ingredients. Here’s an easy recipe from the Spicy Greek website, to kick off your meal with style. Heat 3 tablespoons of olive oil in a large soup pot and saute the onions and chopped chili pepper over medium-low heat, stirring until the onions begin to caramelize, 10-20 minutes. Add the celery and carrots and continue to cook for another 10 to 15 minutes, stirring occasionally. Add the beans to the pot, toss to coat, and pour in the water and add the bay leaf. Bring to a boil over high heat, then reduce to a simmer, partially covered for about 2 hours, or until the beans are completely soft. About 1 hour after the beans begin to simmer, add the tomatoes. Ten minutes before removing from the heat, add the parsley and season with the spices. When the beans are done, pour in the remaining olive oil and lemon juice. Serve hot. Moussaka and souvlaki, probably the most popular Greek dishes, are bound to please any palate. Moussaka is a traditional casserole using eggplant and spiced meat, while souvlaki is basically the Greek version of the Middle Eastern kebab. Souvlaki, which is having a definite moment and is appearing at street fairs everywhere, is made of meat – or sometimes fish – marinated in lemon juice, olive oil, garlic, oregano, salt and pepper and grilled on skewers. Since souvlaki has become popular as a fast food, chicken, lamb, fish and vegetarian versions are also not that hard to find. Tomatoes, onions, cucumbers and peppers are traditionally served as part of the dish, either fresh on the side, grilled on the side, or threaded onto the skewers and grilled with the meat. Tzatziki, a cold sauce of yogurt, cucumber, garlic, dill, and lemon juice is also a traditional accompaniment to souvlaki, as is tahini sauce. Souvlaki is almost always served with or in a grilled pita. Though this sandwich is sometimes referred to as a gyro or souvlaki gyro, “gyro” actually refers to a massive roast cooked on a slowly-turning vertical spit, which is then thinly sliced and served in pita. The Difference Between website describes how gyros and souvlaki differ and no self-respecting Greek caterer would confuse the two. Extra juicy and absolutely delicious, papoutsakia, an eggplant-based traditional Greek recipe, is related to moussaka but special in its own way. Melitzanes papoutsakia (stuffed eggplant) is a Greek dish that gets its name from its resemblance to little shoes. 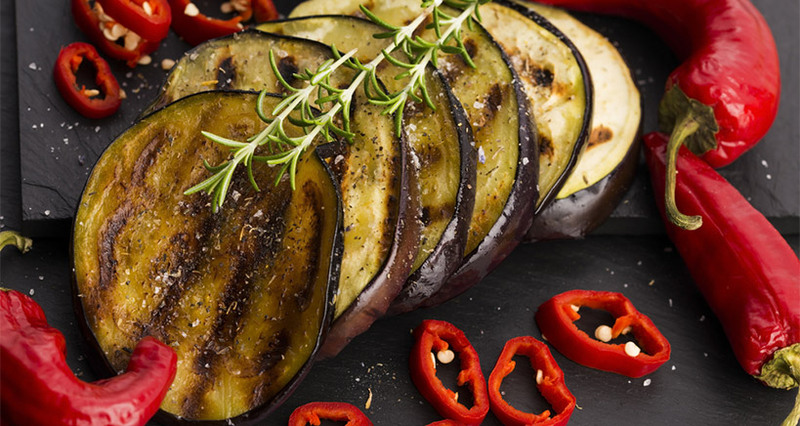 To prepare this delicious stuffed eggplant dish, the eggplants are first seasoned and baked until soft and sweet and then stuffed with a delicious tomato based meat sauce, topped with a white sauce and baked to golden perfection. An alternative topping is a creamy potato puree. Either way, your guests will be impressed. They sound exotic but they’re just stuffed grape leaves, and they’re an easy-to-make appetizer or side dish that will please your clients and their guests. Rinse the vine leaves, remove the stems and leave them in a colander to drain. Place the rice in a colander and rinse with running water. Heat a large saucepan over medium heat, and add 1/3 of the olive oil and the chopped onions. Sauté the onions until translucent. Add the rice and sauté for 1 minute. Pour in 2 cups of warm water and half the lemon juice and simmer for about 7 minutes, until the rice absorbs all the water and is parboiled. Season the rice with salt and pepper, stir in the herbs, and set aside to cool. Layer the bottom of a large pot with some vine leaves (use the ones that are little bit torn) and start rolling the dolmades. Place a leaf (shiny side down) on a flat surface and add 1 tsp of the filling at the bottom end (stem). Be careful not to overfill the dolmades, as the rice will expand during cooking. Fold the lower section of the leaf over the filling toward the center; bring the two sides in toward the center and roll them up tightly. 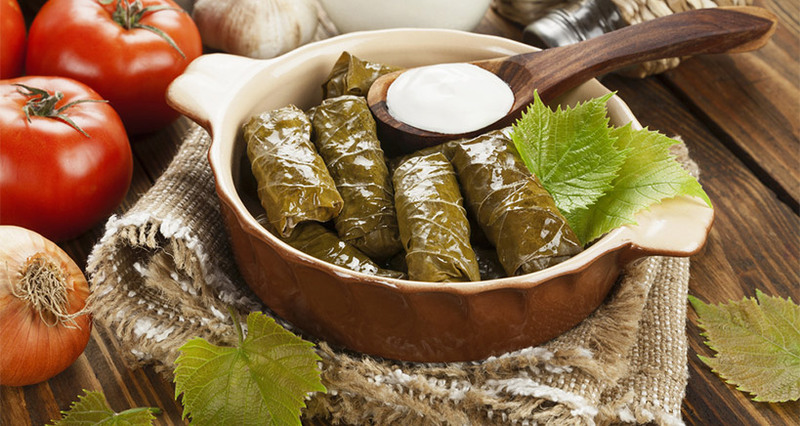 Place the stuffed vine leaves (fold side down) on the bottom of the pot and top in snug layers. Drizzle the stuffed vine leaves with the rest of the olive oil and lemon juice and season with salt and pepper. Place an inverted plate on top to hold them down when cooking and pour in enough water just to cover them. Cover the pot and simmer the dolmades for about 30-40 minutes, until the water has been absorbed and the dolmades remain only with the oil. Remove the pot from the heat, remove the lid and plate and let the dolmades cool for at least 30 minutes. Serve cold or at room temperature with a squeeze of a lemon. Saganaki is fried cheese, cooked in a traditional Greek pan called a sagani. If you don’t have or can’t find a sagani, you can use a small paella pan, a cast-iron skillet, or an oval au gratin dish. Saganaki is a divine treat for cheese lovers; it has only two ingredients – cheese and flour – and it’s fried until a nice golden crust is formed and it becomes semi-melted inside. The key to preparing great saganaki is using the right cheese, one that will hold up well against the heat. The cheeses that are traditionally used in saganaki recipes are Greek cheeses such as graviera and kefalotyri, which are hard yellow cheeses, while regional variations may use halloumi cheese. No matter what you serve at the end of a Greek-themed buffet, baklava, galaktoboureko, or bougatsa, you can expect it to be a combination of honey, phyllo, nuts, and, often, a rich custard. For all the healthfulness of the Mediterranean diet in general and Greek cuisine in particular, the Greeks like their desserts sweet and rich – the perfect ending to a perfect meal. In Greek culture, food is so much more than sustenance – it’s about culture, comfort, family and life itself. Greek cuisine uses the best seasonal ingredients and spices to prepare dishes that date back hundreds of years but that are still relevant and welcome today. Use this guide to prepare a Greek buffet – from appetizers to desserts – and watch your guests delight in everything you have to offer.